Donations of time, talent, or finance for the Spirit of Nature work. Debbie "Takara" Shelor is here to help you and many others move beyond your fears, your inhibitions, your blocks to happiness and success. Her insight and inspiration have helped thousands of people gain a new perspective on life, regain their hope for a powerful positive future, and get clear about who they are and what they want out of life. Here's to Your Magnificence, Takara's free email newsletter, is read by thousands of people around the world. 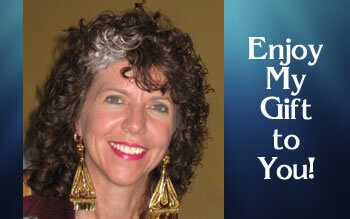 The messages and insights offered are designed to uplift and inspire personal and spiritual growth. And the feedback from subscribers is that they do just that. Just visit the articles archive and you can spend hours reading free insights from Takara. If you like them and want to just give a quick thanks, then click the link on the right to buy her a cup of hot tea - her beverage of choice. 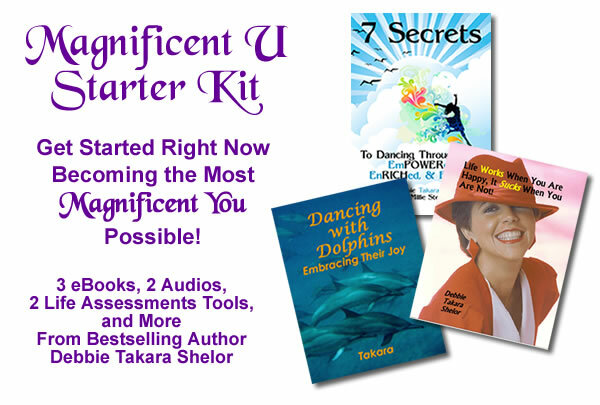 Takara offers tools and technology, as well as private sessions, for individuals to permanently transform the limitations and illusions (the shackles) of daily life into emPOWERment. She also travels leading workshops on land and at sea including wild dolphin swims. Her primary mission to eleviate fear and assist in stepping boldly into the future with confidence, clarity, and joy. Purchasing a product, service, or attending a workshops helps to further this work on a global scale. If you prefer to simply give a donation, or use it as part of your tithe, the button below allows you to fill in any amount you choose. Your purchase of any of the Forchianna/Spirit of Nature products and services, or the offering of a donation, assists Takara to continue her work with individuals and around the world. Your support and participation is greatly appreciated. Visit the catalog to make a purchase. Help get articles or press releases published in your publication or through contacts you know. Assist in contacting local radio and TV talk shows for potential interviews. Help introduce Dancing Dolphin Essences to the stores where you live. Post links to her articles, products, or services on Facebook, Twitter, Digg, etc. Return from Make a Donation to the Spirit of Nature spirituality and shamanism home page.